After I finally decided that I was going back to Cambodia this past April, I did a lot of research about where to stay. Because I was on a very limited budget, I wanted to stay somewhere cheap. 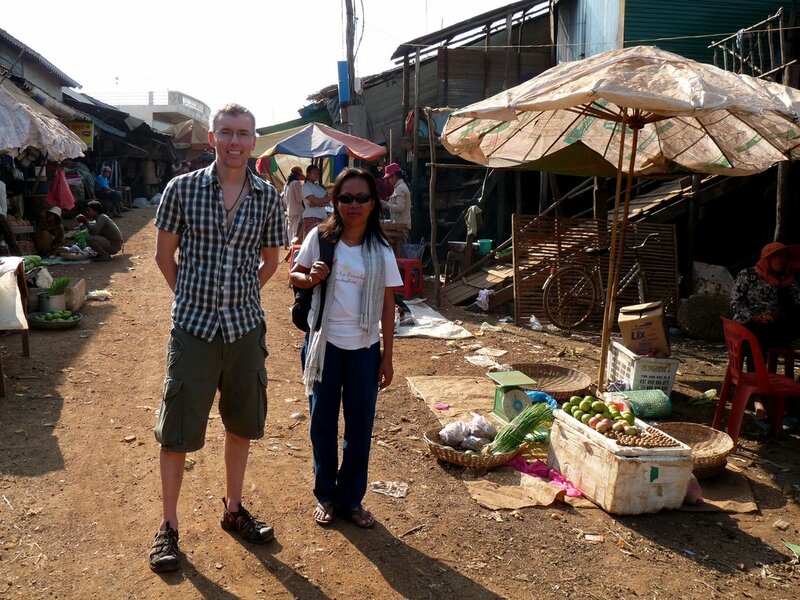 In Cambodia, even in touristy Siem Reap, somewhere cheap isn't difficult to find. Even luxury boutique hotels can be found for less than $80 a night and there are plenty of high quality inns for about $50. My next criterion was to find a place that had some character. Some place that gave me the Cambodian experience. I didn't even mind "roughin" it as long as there were hot showers. I don't care where I am in the world, I have to have a damn hot shower in the morning or else I will be miserable and grumpy. And I hate being miserable and grumpy. After much indecision, I decided upon The Seven Candles guest house. It was definitely inexpensive --I think the rate was $20 a night and yes, there were hot showers. This rate even included Internet access AND flushable toilets (although any solid waste had to be put in a bag beside the toilet). The best part was that when you stay at this guesthouse, you are sharing the house with three generations of the Ly family. They open their house to international visitors and you truly feel as if you being welcomed into a Cambodian household. One night, we had dinner with the family and it was one of the best dinners that we had. No, it didn't have a pool. There wasn't a restaurant attached. The room was a little on the small side but all the benefits far outweighed any drawbacks. And for $20 a night, it was a STEAL. If you are travelling to Siem Reap and want to be welcomed with open arms, then I highly recommend this place. Ponheary Ly is in charge of running the guest house but she is also a tour guide and we spent a full day with her checking out stilted villages and crumbling temples. She is incredibly knowledgeable and just fun to be with. And despite suffering through the ravages of the Khmer Rouge regime, her spirit is kind and strong just like many of her fellow Cambodians. Ponheary Ly is (coincidentally) head of the Ponheary Ly foundation. This foundation provides school supplies and uniforms to 2000 children. Even though the education is free in Cambodia, children are not allowed to attend school if they don't have the proper uniforms so this foundation is incredibly important for underprivileged children. For all her efforts, she has recently been awarded the title of a CNN HERO. Congratulations Ponheary! I feel very honored to know you. If you would like to learn more about this foundation, please check out her website at www.theplf.org.